The Paper Cup Company Pty. Ltd. is committed to providing the best in customer service. We offer professional and friendly assistance to our customers for whatever they may need. That is why we are proud of our continued success in satisfying one customer after the other. Don’t just take our word for it-- be sure to read through our customer testimonials, and you’ll see why we are the best in the business! I would like to thank The Paper Cup Company through yourself for your support of the ‘Farm to Pub’ 2011. Your sponsorship in providing all the Paper Cups for the event was very well received, it was vital in keeping the entrants hydrated before, during and after the event and it helped make the event a great success. We had 195 entrants, numerous volunteers and supporters and raised $9,030- for Beyondblue. This puts out cumulative fundraising total at $27,750-; something we think is great achievement, thanks for helping us to make this possible. I’ve enclosed a little story about how the day unfolded, attached a couple of photographs of the day and a pdf file of our ‘lifesize’ banner, which we used on the day to thank our sponsors, such as yourself which make the event possible. 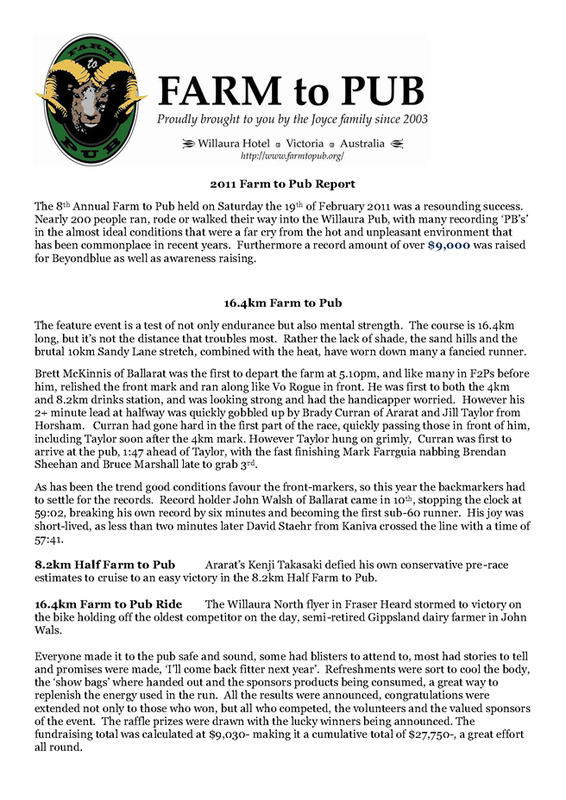 A full wrap up of the day and more photographs are available on our website, namely: www.farmtopub.org. we look forward to hopefully working together again for our 2012 event.